In this post we peek under the hood to explore a handy technique used here at BigML for understanding numeric data. If you are familiar with the MapReduce paradigm, you’ve probably seen the word count example. It’s a simple, distributed way to reduce a large set of words into a more concise summary (a set of unique words and their counts). But what if you want a summary for a set of numeric values? Tracking basic statistics like sum, count, and variance are easy but aren’t enough to really understand the data. A better way is to estimate the data’s underlying distribution. Memory constrained, so we can define the memory available up front. The less memory allocated, the more lossy the compressed distribution. Parameter free-ish. Other than constraining the memory footprint, we want the method to adapt itself to the data without any intervention. Streaming, so we only need one pass over the data. Fast, so we can capture millions of data points in seconds, not minutes or hours. Anytime accessibility, so that we can get an estimate of the distribution whenever we want (even while processing mid-stream). Merge friendly, so that distributions constructed on disjoint subsets of the data can be combined afterword. This makes parallelization and distributed computing (like MapReduce) easy. Robust to ordered data, so that we end up with a decent model of the distribution even if a data stream is sorted or otherwise non-stationary. Some streaming histogram techniques choose their bin locations by peeking the beginning of a data stream. No surprise – these peek methods fail for non-stationary data. Yet Ben-Haim’s histogram manages pretty well. And there we have it, white wine drinkers prefer more alcohol! 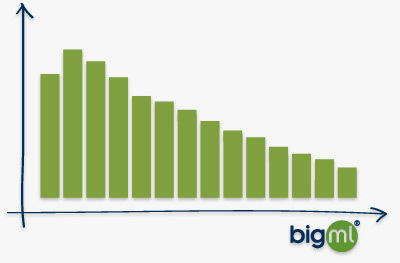 And that’s our short tour of BigML’s streaming histograms. We’re hoping to open source the library in the near future. So check back soon if you’re a Clojure or Java dev.